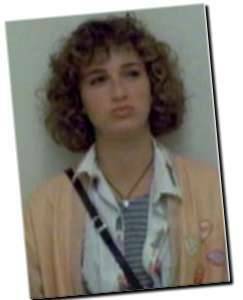 Jennifer Grey plays Jeanie Bueller, the younger, jealous, and angry sister to Ferris Bueller. Jeanie spends most of the film, like Ed Rooney trying to get revenge on Ferris, as she does not understand why everything should go so right for him. She does however find the errors of her way at the end of the film, not to mention finding love, in Garth Volbeck, a young lad at the police station. Born on the 26 March 1960, in New York City, New York, as the daughter of Broadway actor/dancer/choreographer Joel Grey, Jennifer Grey was 25 years old at the time of shooting FBDO. Grey is best known for her classic role of Frances "Baby" Houseman in the cult film, Dirty Dancing with Patrick Swayze, which was recently re released at the cinemas thanks to late nite talk show host Conan O'Brien's obsession with the film. It was this film that also landed her a Golden Globe nomination for best actress in a Comedy/Musical. After Dirty Dancing, Jennifer Grey is probably best know for her nose surgery and her famous quote: "I went in the operating theatre a celebrity - and come out anonymous. It was like being in a witness protection program or being invisible. Some of her other films include The Cotton Club, Reckless, Red Dawn with FBDO co-star Charlie Sheen (Garth Volbeck), If the Shoe Fits and Wind. She also once appeared with the TV series Jeanie Bueller, Jennifer Aniston, in an episode of Friends in which she played Rachael's former friend, Mindy, who became engaged to Rachael's jilted beau, Barry. She also has a new show called called "It's like...you know" in which she plays herself. It's considered to be something like "Seinfeld set in LA." and though I myself have not seen it, I've heard it pretty funny. Though she has never been married she was once romantically linked with her FBDO co-star, Matthew Broderick, of course they've since spilt and he's now married to Sarah Jessica Parker.